Uber has chosen a new chief executive: Expedia CEO Dara Khosrowshahi, according to two sources close to the company. The embattled ride-hailing startup has been without a CEO since founder and former CEO Travis Kalanick resigned in June after an investigation into the company's culture. He remains on Uber's board. Khosrowshahi was not among those reported to have been in the running. The short list included Jeff Immelt, the former CEO of General Electric (GE), and Meg Whitman, the head of Hewlett Packard Enterprise (HPE). Whitman said in June that she wouldn't move to Uber. And Immelt pulled out of the race Sunday because of problems with Uber's board, according to a source familiar with the matter. Expedia did not immediately respond to a request for comment outside of regular office hours. Khosrowshahi took the helm of Expedia (EXPE) when it spun out of InterActiveCorp's (IAC) IAC Travel division in 2005. He previously served as IAC Travel's CEO, as well as IAC's chief financial officer. Uber has been without a chief financial officer since 2015, and the company's head of finance left the company at the end of May. Khosrowshahi has also been a member of The New York Times Company's (NYT) board of directors since 2015. Expedia was one of the first tech companies to challenge President Trump's travel ban in court, citing the potential harm to its employees and customers. In February, during a conference call about Expedia's financial results, Khosrowshahi remarked: "[H]opefully we will all be alive to see the end of next year." Khosrowshahi is an Iranian immigrant. He told Bloomberg BusinessWeek that his family fled Iran just before the Iranian Revolution in 1978 when he was 9 years old. As Uber's new CEO, Khosrowshahi will face a big job, including repairing the company's internal culture, navigating legal battles, and reducing its financial losses. Last week, Uber said its sales reached $1.75 billion in the second quarter, up 17% from the previous quarter. While Uber trimmed losses, the company continues to bleed money -- $645 million in the quarter ending June 30. The company released its latest financial results after several mutual funds marked down the value of their stakes in Uber following a slew of PR crises. Uber has also faced an executive exodus this year. The company needs a CFO, COO, CMO and president. Other top executives, such as Uber's first employee and SVP of global operations, have also stepped down recently. At the same time, Kalanick is being sued by Benchmark, a venture capital firm that was an early Uber investor. 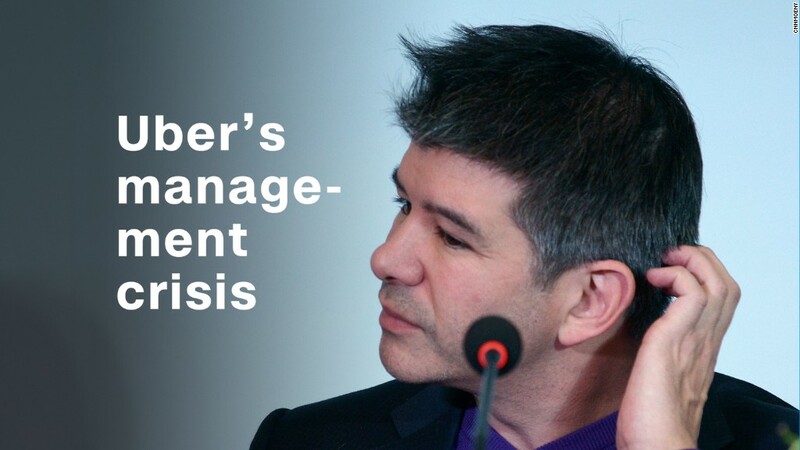 The firm claims Kalanick is trying to "acquire the power to pack the Board to facilitate his desired re-appointment as Uber's CEO." It wants to force him off the board. Kalanick has disputed the allegations, calling them part of a "public and personal attack" on him by Benchmark. As Uber struggles, its competitors have been mobilizing abroad and at home. Domestic rival Lyft has raised $600 million in funding this year and saw an increase in new customers following an Uber boycott. In a blog post at the end of July, Lyft said it had completed more rides so far this year than in all of 2016. --CNNMoney's Seth Fiegerman contributed to this report.